The following will give you step by step instructions for coating your ABS part with epoxy to toughen and help protect your part from the sun and other elements. Attached at the bottom are further detailed instructions about using the EnviroTex Lite compound. Pour-on. 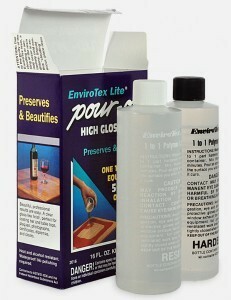 EnviroTex Lite- a water clear reactive polymer compound. 1) Prep your part by making sure there is no dirt or other contaminants on its surface. 3) After thoroughly mixing use a paint brush to apply the resin to the 3D printed model’s surface. Make sure you use a very thin coat as this material will run and puddle while curing. 4) Use a piece of wax paper to place the part on to dry. If you want you can place your part on a turning device to prevent the resin from running.